After two trials and more Betting Oscar wins than any other system or service, Goal Profits has quite a history here at Lay Back! What started as a simple tipping service way back in 2011 has evolved into something with much bigger ambitions. On the other hand, if you want to actually learn how to trade then the sheer number of votes that Goal Profits attracts during Betting Oscars season suggests you won’t find a better place to do it. After a quick recap of the various Goal Profits reviews, trials and Oscar wins I'm going to show you exactly what Goal Profits looks like when you log in as a member. Hans-Henrik conducted the first Goal Profits trial in 2012 and decided that a Neutral rating was appropriate. This triggered a backlash from Goal Profits members who flooded the trial posts with positive comments. For example, Mark said, “I’ve been a subscriber to Goal Profits for around 6 months now and have found it to be an extremely profitable service for me. I agree that this system may not be to everyone’s taste as granted there is a lot of information to take on board when you first sign up and some people simply do not like to put effort in. “Personally I had no idea about the best way to trade the correct score market, but with Steve’s ebook, training videos and daily write-ups I am extremely comfortable in doing so now and regularly achieve similar profits to Steve and on occasions better ones. I’d say my learning curve for this was around 6 weeks, it would have been interesting to see how your results were in the future. A week later, Hans-Henrik posted a further report which showed that his results were slowly improving. As expected, Goal Profits turned out to be ideal for some, not for others. After all, that’s exactly how football trading (as opposed to betting) is too! By 2014, Goal Profits had evolved. A lot. 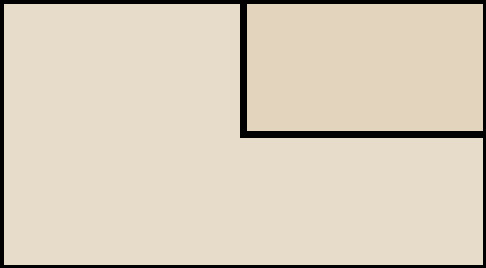 The original creator, Steve Brown, had been joined by Kevin Laverick. There was now a membership area, chat room, live support during in-play trades, lots more trading strategies and “Team Statistics” software which had been purpose-built for football traders. 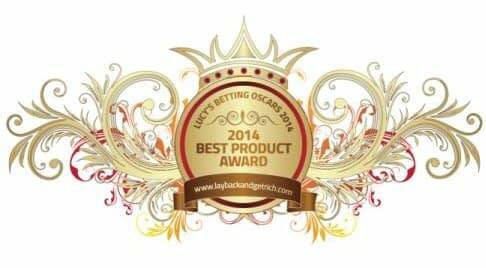 In addition to all that, Goal Profits won two Betting Oscars: “Best Football Betting System” and the big one, “Best Product”. That was more than enough reasons for Lucy to commission a new trial! Ian described himself as “the ultimate non-football fan” which ensured that the educational side of Goal Profits would be tested to the full! At the end of his trial, Ian said, “It’s easy to see why LB&GR readers voted it Best Football System of 2014. The stats on the site are seriously impressive, the chatroom is friendly and supportive and Steve ‘Mr GP’ Brown has been working tirelessly to improve the site and add new features. One is yet another new system which has been trialled positively for 11 months! And more improvements and updates are planned for 2015. “A few things to bear in mind – the amazing stats allow you to devise your own systems and many members do just that. If you’re a footie statistician you’ll absolutely love it! If you don’t want to devise your own systems, there are many systems ready-to-go, not just the correct score system. Again, there were positive comments from readers to back Ian’s judgement. Since those first Betting Oscars wins in 2014, Goal Profits has scooped “Best Football Betting System” and “Best Product” again in 2015, 2016 and 2017. High praise indeed, from someone who has seen the best (and the worst) in this industry. She also elevated Goal Profits into the exclusive “Passed With Flying Colours” club. 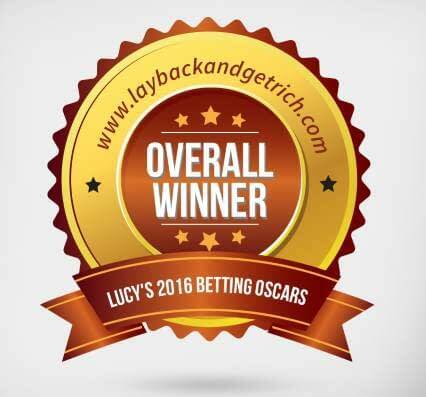 On their way to winning the "Best Product" Betting Oscar in 2017 (for the 4th year in a row) Goal Profits scooped more than 40% of the total votes. That's a staggering amount! So should there be a third trial? Well... going back to the previous two reviews, I think it’s clear that there’s a learning curve involved. Results for both Hans-Henrik and Ian improved over time so it would almost make sense to have a reviewer spend six months learning and gaining experience, then starting the actual review. But we’d be talking about another year to trial a service which has been voted the best by LB&GR readers consistently since 2014. 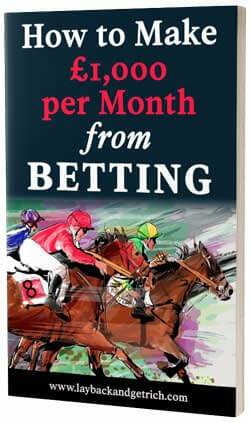 With Goal Profits, it’s not a case of simply receiving a few tips and placing bets. There’s no clear “win” or “lose” as with straight betting, so it’s difficult to track meaningful results. Instead, I asked Steve for access to Goal Profits so that I could see it all for myself. 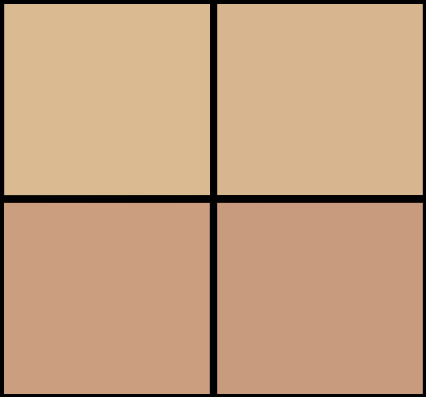 I’m delighted that he obliged, so here’s my overview of what is available right now. When you first log in to the Goal Profits Members Area you see a space rocket and a clear instruction to start with that. “This is ‘Launchpad’, your introduction to the fantastic world of football trading. 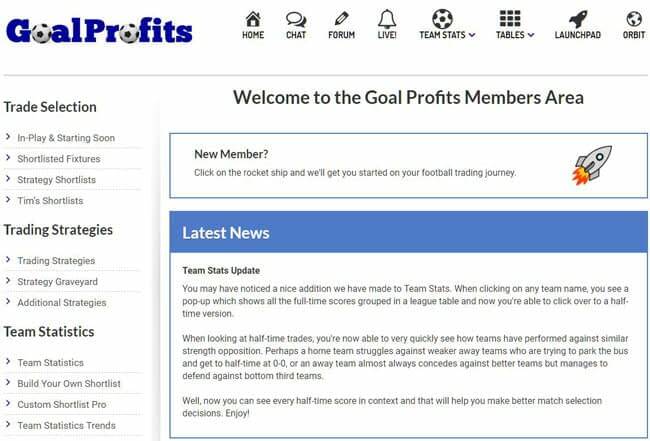 Over the next 16 weeks we will introduce you to the Goal Profits Members Area, Team Stats and all 16 strategies you now have access to. “As well as daily access to both Steve and Kevin, you will also be able to contact ‘Launchpad Mentors’ who started out with Goal Profits exactly where you are now and have gone on to become competent football traders – even full-time professionals. It goes on to explain what the “GP Basics”, “Trading Basics”, “Weekly Modules” and “Orbit” sections offer. I’ll get on to those in a minute. The “Launchpad” page then explains all the help and support options which are available to members. This includes the chat room, forum and personal email addresses for both Steve Brown and Kevin Laverick. Customer service at Goal Profits has been repeatedly praised over the years and I can see why! GP Basics: This is a quick introduction to the membership, including FAQs and a glossary of trading terms. Trading Basics: This section has articles called “Mindset”, “Build Your Portfolio”, “Bank Management”, “Staking”, “Results”, “Dealing With Losses”. It’s an introduction to the basics of football trading in general and an interesting read. Weekly Modules: There are 16 of these, though they don’t have to take a week. Experienced football traders might be able to work through them faster, while beginners may take a bit longer. I do like the flexibility of being able to work at your own pace and – crucially – you’re not locked out of anything so you get full access right away. Orbit: I guess the idea here is that Launchpad leads to going into Orbit which keeps the space rocket theme going. It’s more… not advanced as such… but for members who are a bit further down the road and trading successfully. The topics covered are “Psychology of Trading”, “Trading Styles” and “Financial Freedom”. I couldn’t resist a closer look at the “Financial Freedom” section! It’s another mini-site which deals with investing your trading bank once you get to a certain point. Steve explains that once you get to a big bank size, you only need a small part of it in Betfair and rather than let the rest sit around, there are ways to invest it so that it’s working too. I’ve never even thought about this before, let alone seen it explained! I ended up reading the entire section and feeling quite motivated afterwards! Steve talks about low-risk, medium-risk and high-risk investing. Everything from Premium Bonds which are ultra-safe and easily accessible up to Bitcoin which is very risky. It’s fascinating stuff and Steve urges Goal Profits members to be “smarter than the average football trader”. There are currently 16 trading strategies in the Members Area. 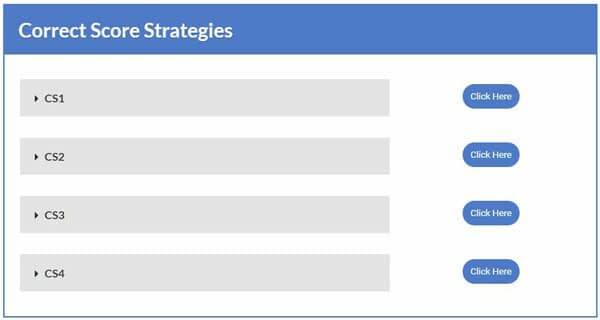 They are grouped into “Correct Score Strategies”, “First Half Strategies”, “Second Half Strategies” and “Full Match Strategies”. None of them seem to be truly straight betting – as in you could set something up in the morning and then check results later – but a number of them involve getting into a trade once certain conditions are met and then there’s either a goal or not. In that respect, it’s perhaps a betting/trading hybrid. One comment on the original trial suggested that it’s necessary to sit in front of your PC watching every last little detail for 90 minutes or even watch the football matches. I asked Steve about this and he said that he very rarely watches matches he’s trading because he has already done his research up to a week in advance using the Team Statistics software. Once the match kicks off he’s only interested in things like shot and corner counts. Steve went on to say that, “when I’m interested in trading a game in the first half, I already know pretty much when I’m planning to enter the trade. I don’t need to sit in front of my PC watching the numbers tick up though, I can go watch TV, do housework, wash the car, whatever I want. These days, I could even be out shopping! But wait… what about correct score trades? They require sitting in front of your PC for the entire 90 minutes, don’t they? Well this was news to me as I thought that it would be necessary to spend the entire 90 minutes trading matches. Steve also pointed out that many of the strategies focus only on the first or second half only, so that’s a maximum of 45 minutes anyway. Of course… that makes perfect sense! So there are 16 trading strategies in the main section. They are all introduced one by one in Launchpad and some of them have video examples of live trades. In addition, there’s a rather creepy “Strategy Graveyard” which has another 25 strategies of various types. Goal Profits has a "Strategy Graveyard"! They’re generally older or retired strategies which many of the more experienced members still like to use – and it’s open to all members. Steve suggested that I check out something called “H00T” on a Friday evening and it made me a small profit, so it seems that there’s more to Goal Profits than what first meets the eye! There are a number of trading tools available, even to non-members. Check out the Dutching Calculator, Hedging Calculator and Betting Calculator. There’s even a list of official Twitter accounts in the top leagues so that you can check team news and that sort of thing. Perhaps the most useful free tool though is the Free Football Stats page which gives you a glimpse into the sort of thing that Team Statistics provides (more on that in a sec). When you check it out, make sure to click on team names to see the interesting (and colourful) way that results are presented. And this is just the free stuff... members get a lot more. There are lots of pages in this section of the Members Area and each of them has a bajillion numbers for every fixture a week ahead. With some of them, you even have a little button which pops up with yet more information. It never ends! 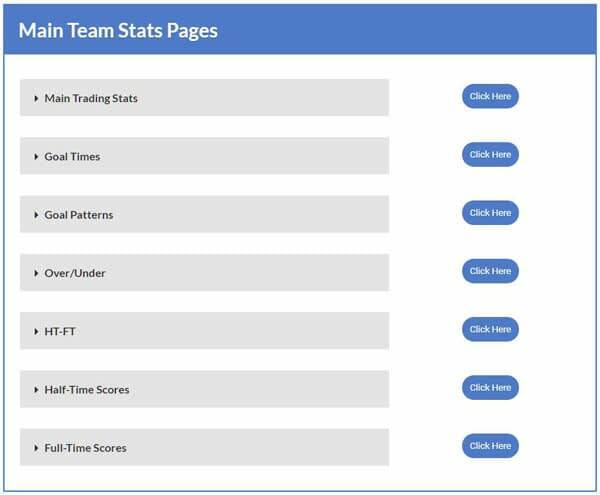 In the “Main Team Stats Pages” section there are 7 pages which contain everything from goals scored, conceded, over 2.5 goals (and every other over/under too), BTTS, goal timings, HT/FT results and so on... and on. You get form pages (5, 10, 15 fixtures) and a tool which allows you to compare any two teams in the world as if they’re about to play a league game. There are then statistics to help with “Assured Soccer Profits” trading and yet more pages which examine corners, shots, cards, referees and so on. The Shortlist pages allow you to customise the fixture list within certain parameters, perhaps a minimum number of BTTS results or first half goals. Team Statistics Trends has ten years worth of data for each league looking at goals, home/away wins, 0-0 scores, etc. 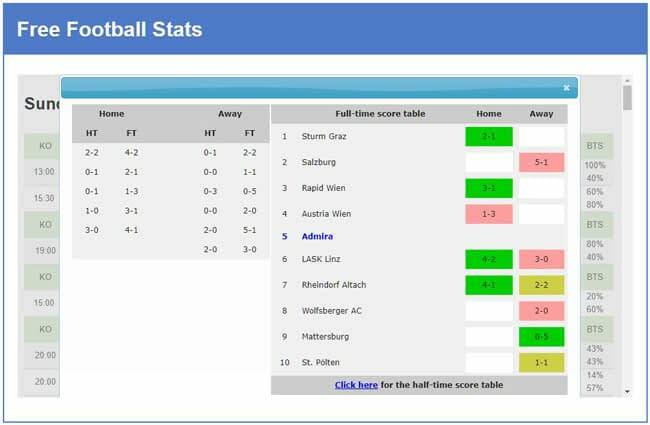 For example, if you want to see which leagues have the most over 3.5 goals games, this is the place to find out. There’s also a “Prediction Site Analysis” which looks at the likes of WinDrawWin and SoccerVista to determine how accurate they are with their score predictions. 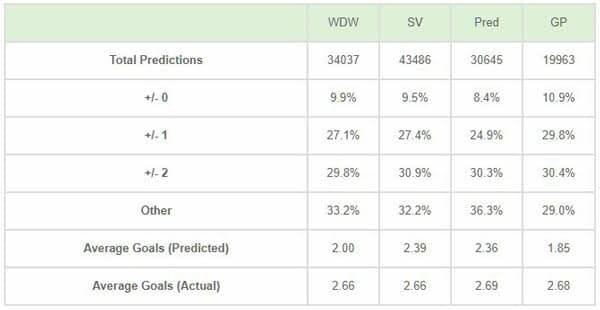 It’s interesting to note that the Goal Profits score predictions are doing better than all of the others over 20,000 or so logged results. As if that wasn’t enough, there are 26 – yes, twenty-six! – different league tables for every league included in Goal Profits (currently 65). I didn’t know there were that many… but I’ve now been able to look at home, away, first half, second half, form, attack, defence, over, under and all sorts more. I’m not sure who on earth would have the time to go through that much data so I asked Steve whether the league tables are popular with members. He said, “The league tables are very useful for different types of trades, but there’s an awful lot of information there! What we have done is used Team Stats to do much of the analysis for us and present it all on the ‘League Table Analysis’ page”. “We then went a step further and developed a series of shortlists so that Team Stats is doing even more work and allowing us to concentrate more on trading”. Um ok… but what does it actually do? Steve explained, “There are certain teams which play above or below their actual league position in certain areas of games. 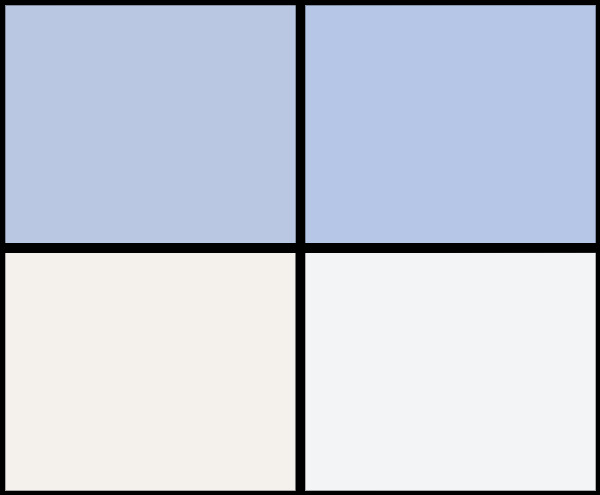 For example, the LTA page will tell us which teams play above themselves in the second half and that gives us a unique advantage. Many of the opportunities identified would simply remain hidden if we didn’t have this tool”. He went on to say, “During the 2016/17 season, LTA identified very early on that Burnley were playing above themselves at home and we were able to match them up with weaker away teams to make a significant profit”. 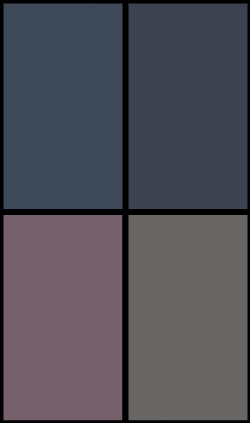 I have to admit, the “League Table Analysis” page at first glance looks like a random bunch of coloured numbers but it does start to make sense pretty quickly. Having spent some time in the chat room (quietly stalking!) it is certainly popular with members who constantly sing its praises. The Live Trading Module (also known as "LTM") was added to Goal Profits during the summer of 2018, just in time for the World Cup. It tracks shots, corners, dangerous attacks, possession and yellow/red cards throughout matches as they're played. It also shows you what has happened during the previous 10 minutes only, so that you can see where the action is currently. You can even filter matches based on a multitude of criteria you set yourself. Certain scores, minimum numbers of shots, match time and many more options are offered. The "Alerts" section shows you which games qualify for various Goal Profits trading strategies as well as added time and that sort of thing. There's also a "Rating" which calculates the likelihood of a goal, based on a number of factors. I asked Steve more about this and he said, "It's important to remember that goals are random events with many variables, including player ability, referee decisions, weather conditions and so on. Unless you have a crystal ball and you can see the future, you simply cannot predict accurately and consistently when goals will be scored." He continued, "The LTM Rating highlights which teams are actively attempting to score and from that, we can determine where goals are more or less likely to occur. Predicting the future is impossible, but the LTM raises the odds in our favour - especially when used in conjunction with the rest of Team Stats." "We have been developing the LTM since 2014 and making improvements as we go. Now that we have a good base to build on, we will be adding new features and analytical tools which will give Goal Profits members an even bigger advantage over every other trader." The Live Trading Module is certainly very interesting. I have sat here and watched the "Rating" numbers predict goals often, but not always. I'm looking forward to seeing the new features. Speaking of the chat room, I have spent some time observing the goings on. It’s pretty busy during the times when Steve and Kevin are trading (and they tell you when that will be) but a lot quieter at other times. They both walk members through correct score trades in their own ways, plus they post some additional trades too. Just this evening (I’m writing this pretty late!) they were both in the chat room. Steve’s correct score trade finished level (he calls it “scratch”) but he did post a winner in France for over 2.5 goals. Kevin’s correct score trade finished exactly on target which was really impressive! Every member made a profit from what I could see and there were lots of happy messages. There’s a definite air of professionalism when members are at work, unlike other chat rooms I’ve visited in the past. Steve and Kevin aren’t throwing lots of trades about either. I get the impression that everything is well thought through and that they take a genuine pride in their work. Also, there’s a forum available which has lots of questions, answers, ideas and “trading diaries”. One of the previous criticisms of Goal Profits was that there were extras which members had to pay more for, however these have now been included so that all members have full access to them. There are also a few freebies sent out to new members, including 3 months free access to the Pre-Match Scalping Module. This identifies upcoming fixtures in which there is price movement and an opportunity to make a profit before the match even begins. I have to admit that I found it quite confusing and Steve said that it does take time to understand, but that the rewards are sizeable for those who “get it”. New members also receive free copies of Kevin's "Trading Masterclass" eBooks for “Scalping” and “In-Play Trading” at various times. The one remaining paid extra I could find is "Team Stats Excel". This is a spreadsheet sent daily which logs all the statistics before play and then the in-play stats and results of the games. It is for those who want to research their own systems and/or automate their own selection filters. Oh and a few Goal Profits members have developed their own systems and sell the tips. David, for example, has guided his subscribers from a £200 bank to £1,000 4 times using only lay the draw and his tips are just £10 per month. That seems very reasonable for those who want to get involved. If you have read this far, thanks for staying with me. It was a long one! There is so much in the Goal Profits Members Area and Steve says he’s working on yet more improvements, updates and additions. Back in 2015 he said to Lucy, “I have big plans to add loads more over the coming months…” which she said, “is typical of the man and his endless energy”. 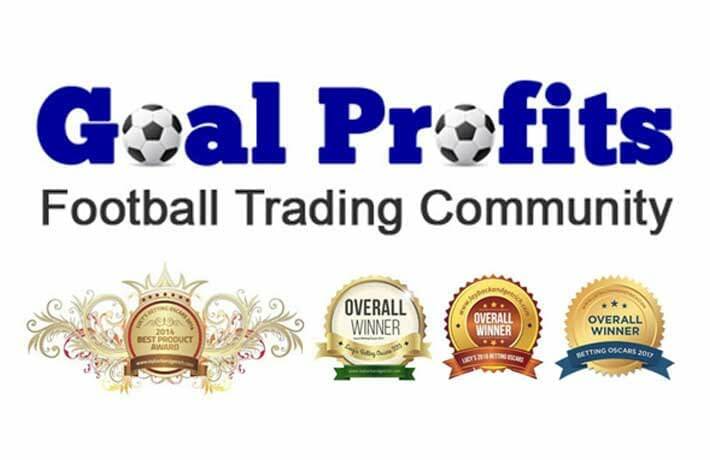 Lucy continued, “Truth is, Goal Profits is always developing – and is already a comprehensive product that is turning hobbyist punters into professional traders”. It seems that the energy reserves haven’t run dry just yet and that Goal Profits will continue its journey, taking plenty of happy members along for the ride. If you haven’t guessed yet, I have been seriously impressed (and a little daunted) though I’m sure that working through Launchpad properly would help no end. Also, I received fast replies from Steve to all my (probably annoying!) questions. Again, if you just want some tips and minimum effort then Goal Profits is definitely, not for you. But if you want to get stuck in and learn a lot about trading then I haven’t seen anything better. And with the exclusive Lay Back offer you will get 2 months for the price of 1 as well, so that’s going to give you plenty of time to learn the basics with as little risk as possible.